Many were disappointed with the release of the Samsung Galaxy S5 a few months ago when the device was unveiled with what most people in the tech community referred to as minor specification upgrades not warranting the flagship status. The phone was a victim of Samsung’s own success, being famous for releasing flagship handsets at the bleeding edge of specs, the Galaxy S5 failed to live up to people’s high expectations. Soon after, rumours began to stir regarding a more premium version of the Samsung’s flagship smartphone often dubbed the “S5 Prime” or “Galaxy F”.Over the next few months things seemed to get more confusing as leaks popped up with images of a Samsung smartphone sporting a seemingly metallic build. 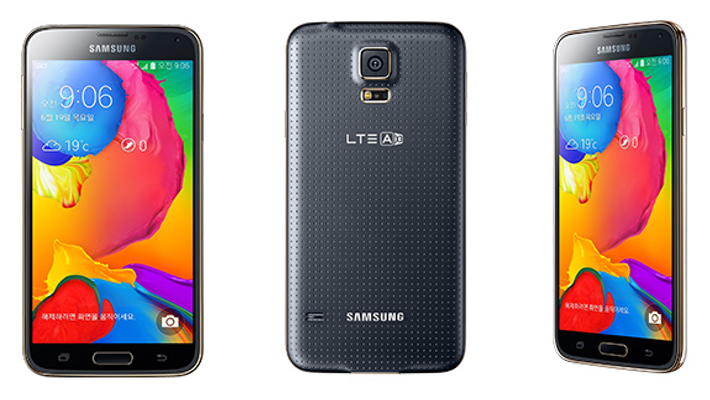 However as time drew on it was clear that one of the devices leaked multiple times had to be the Galaxy S5 LTE-A. The LTE-A edition of the smartphone was announced this Wednesday exclusively for South Korea where the ultra high speed LTE Advanced network is supported. The device brings back the same sized display at 5.1 inches diagonally along with the fingerprint scanner, heart rate sensor, 2800mAH battery, IR blaster, IP67 certification meaning dust and water resistance and a 16 megapixel ISO Cell sensor (recently crowned the best smartphone camera as of now). That is where the similarities end though, the new display is a WQHD 2560X1440 Super AMOLED panel instead of the S5’s 1920X1080 display, giving it a pixel density of 577 pixels per inch which is therefore the sharpest display in the market. The device is the first to feature Qualcomm’s Snapdragon 805 processor, sporting Krait 450 cores, 3GB of RAM, and very impressive 225Mbps LTE – Advancedspeeds. There is 32GB of internal storage and support for a 128GB MicroSD card. The new device obviously features Samsung’s TouchWiz UI on top of Android 4.4 KitKat and will be available in Charcoal Black, Shimmer White, Electric Blue, Copper Gold, Sweet Pink and Glam Red. The Galaxy S5 LTE-A will set back buyers 940,500 won (roughly US$920), as of now there is no word on an international release. It was not very surprising to see Samsung release a higher spec-ed LTE-A variant of their flagship as the company had done the exact same with the Galaxy S4 last year. What concerns me most is the fact that Samsung stuck to the same sized battery for a display with a much higher pixel density. The battery life of the original S5 was good but to keep a display with this many pixels lit up will surely drain the battery fast. A last wandering thought, with the LTE-A version of the device providing such spec bumps, is it still justifiable to call the device a variant of the Galaxy S5? This upgrade is essentially what happened when moving from the Galaxy S to the S2 to the S3 to the S4 and finally to the S5. So does that mean we already have the Galaxy S6? Just some tech for thought.